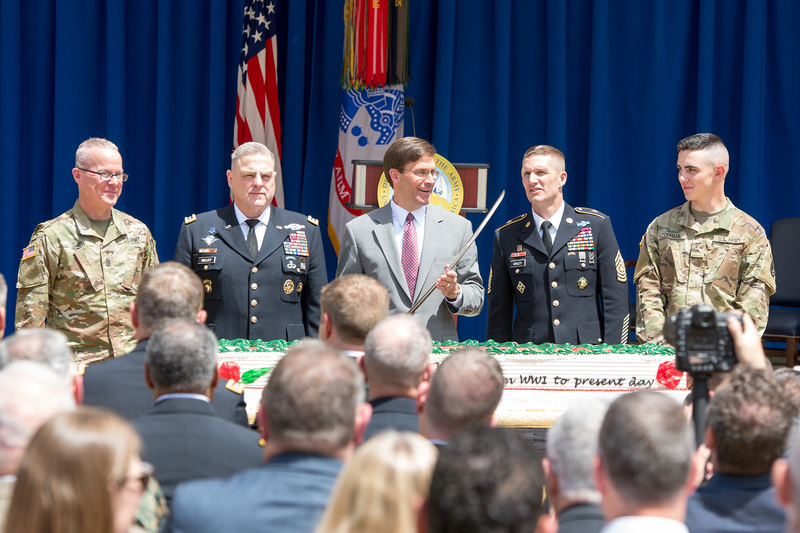 While reflecting on the Army’s nearly two-and-a-half centuries of defending the nation, Secretary of the Army Mark T. Esper said he also remains optimistic about the future of the service he leads. “We are modernizing the force. We also have a new vision ... that tells us where to go, how to get there, and when. And I’m confident with this vision,” Esper said. In the courtyard of the Pentagon on June 14, Esper was joined by Deputy Secretary of Defense Patrick M. Shanahan, Chief of Staff of the Army Gen. Mark A. Milley, and Sgt. Maj. of the Army Daniel A. Dailey to celebrate the 243rd birthday of the U.S. Army. Shanahan echoed Esper’s remarks, saying he too felt good about the Army’s direction, especially when it comes to modernization efforts. He also acknowledged the soldiers, civilians and families that help keep the Army in the fight. “We have amazing families that support the missions. And when you look across the globe at the missions our men and women are supporting, it is nothing short of remarkable. We have a remarkable team,” Shanahan said. In addition to celebrating the Army’s birthday, Milley also had opportunity to celebrate the decision of 27 soldiers to continue their service to the nation. Those soldiers stood at attention while Milley administered the oath of enlistment and also explained to them what that oath means. “We’re taking an oath to a document – the Constitution of the United States of America – and we’re taking an oath to the idea embedded within that document,” Milley said. However, freedom doesn’t come without cost, Milley said. He reminded those in uniform that the oath sometimes requires service members to make a sacrifice. Among the group of soldiers reenlisting were Cpl. Louis Delgado, a human resources specialist, and Spc. Eric White, a wheeled vehicle mechanic. Both soldiers said they considered themselves lucky to have participated in the birthday event, and to have reenlisted at the Pentagon. In addition to serving in the U.S. Army Reserve for 13 years, Delgado maintains his commitment to helping others by working as a firefighter and emergency medical technician in Orlando, Fla.
As he progresses through his career, Delgado hopes to move up the ranks and pass his love for the Army down through his family before he retires. On the other hand, White has only served in the Army for under four years. Stationed out of Fort Belvoir, Va., the young soldier reenlisted for another two years. However, he maintains his commitment to his goal of completing his graduate degree before leaving the force. “Reenlisting makes you think back to the past and the other people that have chosen to take the oath and be all that they can be for this great nation. It’s very humbling,” he said. The oldest and youngest soldiers in attendance took the stage with the Army senior leaders for a cake cutting ceremony. Command Sgt. Maj. Daniel R. Smith, the command sergeant major of The United States Army Band, “Pershing’s Own,” was named the oldest soldier at the event. With more than 26 years of service, Smith said he was both honored and inspired to be selected. Pvt. Alexander Coffman, the event’s youngest soldier, has served in the Army for six months. Coffman, 18, enlisted in the force as an infantryman, but was later selected to join the 3d U.S. Infantry Regiment (The Old Guard), the Army’s official ceremonial unit. Optimistic and driven, Coffman said he couldn’t wait to see what lies ahead for his Army career. “Seeing seasoned leaders pass the Army onto junior leaders – future leaders – I’m proud to be part of that legacy,” Smith said.